B. Thomas (Arlington, Texas, United States) on 23 July 2017 in Animal & Insect. Axis deer are also called chital deer or spotted Indian deer. In India, the axis deer population has declined mainly due to habitat loss. It is considered by many to be the most beautiful of deer with a bright reddish coat marked with white spots that remain throughout its life. They have two large antlers that can reach 30 inches in length and usually only have three points. Axis deer can often be found near a stream with a ravine for shelter. They prefer territory with woody vegetation for cover and open areas for feeding. Size of their home range varies with habitat but averages two-and-a-half square miles. Axis deer are less nocturnal than most deer, usually feeding for four hours after sunrise. Then, they seek water and rest in the shade during the midday heat, returning to feed for a few hours before sunset. One evening at Texas Safari Ranch my friends and I sat out in rocking chairs on our porch and watched these axis deer in the fading light. Nice capture. They look lovely. It is very nice to sit and watch the deer. I envy you. wow...a natural arch by the trees.....They looks lovely !!! 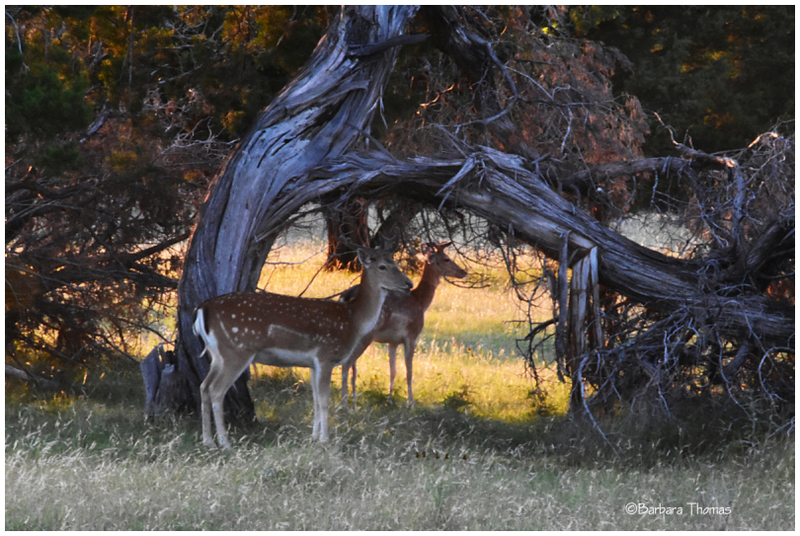 Nice framing of these deer by the "arch" of the tree!! They are beauties. A lovely capture in this late light.